When I opened the envelope, I found two introductory cards and a soft pouch containing this month's perfume selection. Everything was nested on a bed of pink grass. The other card is from Jessica, who was this month's Scent Muse. 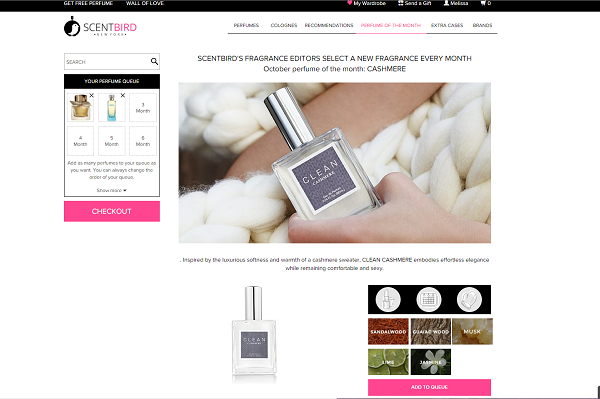 It provides her social media contact information so you can follow her, and the other side outlines November's Perfume of the Month (Aquolina Pink Sugar Sensual). The perfume that I was sent is called 'Anna Sui Forbidden Affair'. This was actually recommended via the online recommender. I was a little nervous about ordering blindly, but I was not disappointed! 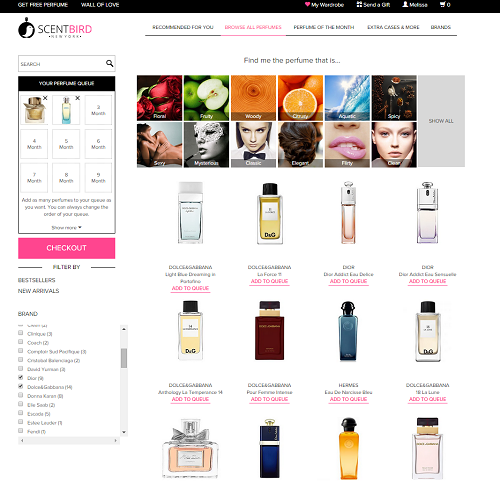 Each perfume insert is labeled with the brand and the name of the fragrance. Plus, you get a large amount of it! This is not a sample size. 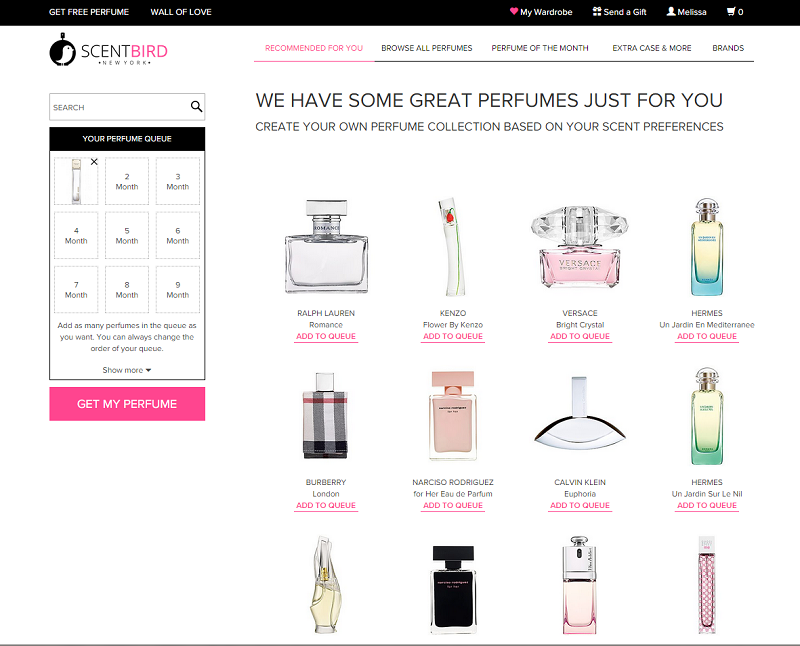 After I was done, the generator brings up a huge list of perfumes that I may like based on my preferences. I selected 'Forbidden Affair' by Anna Sui. What's funny is I actually own a lot of the ones that were recommended to me, so I know the quiz was pretty accurate! Now, when I logged in I noticed a few different things, so I wanted to go through them. This portion isn't new but I didn't really go over it last time. 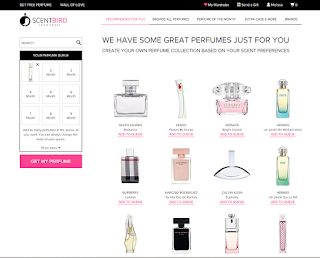 So, if you click on 'Browse All Perfumes' at the top, you can select a perfume based on the notes at the top, and you can filter through 'Bestsellers', 'New Arrivals', and even 'Brands' on the left. 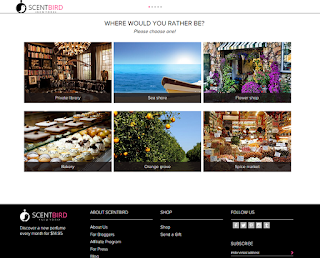 Every time that I visit this site, there are so many new arrivals! Next, if you click on 'Extra Cases & More', you can select a new color case (they added more since last time!). Use code "THRIFTYLIFE15" for 15% off of your first month!